00:25:00 Makes 8 servings, 1-1/4 cups (300 mL) each. Makes 8 servings, 1-1/4 cups (300 mL) each. This flavourful soup can be on the table in just minutes. And it's super easy to make since the pasta cooks with the remaining soup ingredients to make a one-pot recipe! Combine all ingredients except cheese in saucepan. Bring to boil on high heat, stirring occasionally. Simmer on medium heat 10 min. or until chicken is done and pasta is tender, stirring occasionally. Prepare using Mexican-style diced tomatoes and canned black beans. 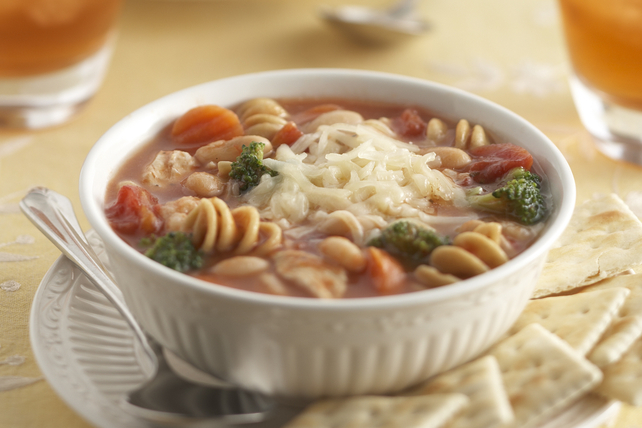 Up your calcium intake by serving this tasty soup that's a good source of calcium from the cheese. And as a bonus, the vegetable blend provides an excellent source of both vitamins A and C.
Serving Size Makes 8 servings, 1-1/4 cups (300 mL) each.